How learning x teaches y – or does it? Here’s a throwback pic to some of the families in our babysitting circle back at a 2009 get-together. The youngest in the circle are now 8 years old and the oldest 18+ so what extra-curricular skills were most useful for them? This isn’t spring flower power in Wales, this was a maths lesson about daffodil debts! But if I force myself to be honest I also think that those three traits – resilience, empathy and hard work – are life skills that I wanted to pass to my own children. I also like kindness but even horse-crazy me has to admit that riding a horse doesn’t necessarily teach you how to be kind. Confidence – even the kids who aren’t into the jazz hands spotlight. Good communication – the ability to say what you want and for people to understand what you are saying. Being able to control a horse and enjoy riding tends to push away all other problems. Riders photographed in 2015. What do we want from our children? Thinking again of those dancers I understand that patience has a place, but I don’t rate it as highly on the grid of useful life skills (relying instead on distraction, perhaps also learnt from horses?). Parents know that confidence is highly likely to be given a boost by dance or acting classes, which will surely be handy in the long run, but I have no idea why anyone would care much about knowing “the way the body works”. But clearly plenty of parents do – the dance classes I tried to send my toddlers to were over-subscribed. Once we moved up the waiting list and secured a place I was shocked to find that every tot was in a frothy tutu and ballet shoes. It was a big lesson for me – everyone takes their profession very seriously, and expects the kids doing it to do so as well. Dancing, equestrianism and American football (although it could just as easily be football) have some similarities – you need to be fit and are at risk of injury. But in terms of what you are learning as a life skill they are very different skills. And once you’ve learnt those skills who makes the most interesting dinner guest or most effective entrepreneur or parent? So what sport or skill (eg, art, craft, needlework, orienterring) do you love which you think passes on vital life skills? If you have teenage children what do you think has been the most essential thing they’ve learnt to do, and you don’t regret spending a penny on? There are no right or wrong answers for this by the way – it’s clear we all have such very different hopes and dreams. Looking forward to finding out your answers. Have a good May Day. Is it worth going to Bletchley Park? Utter junk becomes an arty dalek cage. Notice the number of useful spy kit items, including dark glasses and moustaches. Either everyone wants to be a spy, or Bletchley Park has a way of appealing to every generation. When I asked a lovely lady in the café which is housed just by the Mansion, in Number 4 hut, why Bletchley Park was so busy despite it being a wet Saturday her look of astonishment almost made me laugh. “This isn’t busy. You should see what it is like in the summer!” was her follow-up. So is it Benedict Cumberbatch who’s made Bletchley Park a must visit? Or is it the extraordinary story of Alan Turing’s cracking of the Engima code? Are all these people here today mathematicians, linguists and engineers? Or did they have relatives who worked here? Or is it the fact that this place has the best audio visual tour I’ve ever seen – great quality, short snapy info and super simple to use? Without getting hold of an exit survey I’m not going to be able to answer those questions… but a trip to Bletchley Park is brilliant with a teenager. And you could easily bring along younger children, who are so often up for anything, as well as an older relative who might remember WW2. There’s so much about WW2 that I hadn’t realised. For starters Bletchley Park is where many women got the chance to do exciting – and secretive – work. They had to sign the Official Secrets Act, and as we now know this meant for years no one knew what had been going on in this corner of Buckinghamshire, conveniently located opposite Bletchley train station. In July 2011 the Queen made a speech at Bletchley Park praising the workforce. In 1939 there were 200 people, but by 1944 there were 10,000 working at Bletchley – of which two-thirds were women. Clearly women got the chance to escape – often controlling – families, use their brains, feel needed, be part of the war effort and enjoy romance. Hut 8 is where Alan Turing and his team cracked the Enigma code. Nell and I especially enjoyed seeing the desk where he would have worked, complete with an old-fashioned typewriter with a note in it saying he’d gone to lunch. The film makes it seem like so few individuals cracked Enigma, but going round Bletchley it’s clear that the combination of superbrains was what made cracking an almost impossible cypher was how it was done – and without Polish input it would have been much slower. I was also rather taken by the use of pigeon post during WW2. In one hut there was a parachute for a pigeon. At the time there were 400 pigeon handlers in the army working 20,000 pigeons. Pigeon racing is far less popular now but a display at Bletchley Park suggested that there are around 30,000 racing pigeons in modern racing lofts. Cost: Expensive (£16+) but if you plan to come by train download a 2 for1 entrance and show this with your train ticket to get half price entry. Tickets are valid for a year so if you live in nearby Herts or Bucks or plan to visit a few times then it’s much better value. Getting there: We took an off peak train from London Euston. There are three or four trains an hour and the station is a well signposted 4 minute walk from the entrance to Bletchley Park. In the gift shop: clever prezzies for clever people (eg, mugs emblazoned with the message ‘Weapons of Maths Destruction’). Where else have you found that works well for entertaining all ages? Impressive den in Quarry Woods near Cookham. This area inspired Wind in the Willows writer Kenneth Grahame. Big adventures are fun, but they are often hard to organise, and expensive. Of course you don’t have to cycle the Alps to have an adventure. You can have them in the UK, but as so much of British outdoor life is weather dependent getting a party together (especially of mixed ages) to do something on a set day you can all make can be easily spoilt by grey skies, a stiff breeze and a downpour. And so micro adventures were born.Big adventures are fun, but they are often hard to organise, and expensive. Of course you don’t have to cycle the Alps to have an adventure. You can have them in the UK, but as so much of British outdoor life is weather dependent getting a party together (especially of mixed ages) to do something on a set day you can all make can be easily spoilt by grey skies, a stiff breeze and a downpour. The name appears to come from Alastair Humphries, see his website here. But a micro adventure can just be going somewhere different, or going somewhere you know well and really exploring it in a different way.Instead of going on mega trips occasionally – he was 24 when he decided to ride around the world by bike (which took four years!) – he goes on little ones, often. I love this idea. I need my adventure quotient topped up, ideally outside. For me one exciting walk a week is enough, but I also try to keep bigger adventures on the go in case I lose inspiration. At the moment my family is finishing off the New River Walk (approx. 30miles from Hertfordshire to London along a stream that is neither new, nor a river). We just do a short stage when we fancy. I’m also planning to walk a lot more of the Thames Path. Alastair’s website is all kids in sleeping bags roughing it without tents – you can do that in a garden too, it doesn’t have to be a super glamorous overseas location. His current challenge is to get people to commit to spending one night a month under the stars for a year. It’s a lovely idea and you’d learn so much from it. I’m thinking about it… but rather suspect that I won’t. Alastair is super creative (he funds his blog by asking people to shout him a coffee – the £2.50s add up and as a result he’s got a fab site). His adventures are incredibly varied and I am sure would be happy to spend a day climbing a tree to really develop a sense of what that particular oak is really like, and which little critters and birds visit it. My micro-adventures tend to focus on taking the dog for a walk in the woods. There is nothing I like better. Although if you can throw in an art gallery and a nice cosy pub I’ll be extra happy. So visiting Cookham in Berkshire (the train from London goes to Maidenhead, then you change for the 10 min ride to Cookham) was perfect. Coming down the chalky side of Winter Hill some teenagers were playing on the shallow flooded meadows. it was icy and couldn’t hold their weight but they were having such a fabulous time ‘moon walking’ and sinking up to the top of their wellies. it looked a lot more fun than spending the weekend on your phone. I followed a 7-mile walk through Quarry Wood and up steep Winter Hill then down a chalk hillside for a last one and a half mile stroll along the River Thames back to Cookham and the Stanley Spencer art gallery in the old Methodist church. Cookham, or “village in heaven” as the crabby but talented Stanley Spencer called it. His art is full of portraits of the locals and local scenes. I love the way flowers twine themselves into his pictures and the majority are making Cookham the ultimate destination. There are at least six pubs in Cookham, and all seemed to serve food (there’s also the Teapot Tea shop in the high street which had delicious looking cakes). We tried the lovely old Bel & the Dragon, an old coaching inn. But a glass of white wine cost £9!! So for the next round we went to the Old Swan Uppers where for £7.50 I got a half of good beer, an even better glass of wine and a packet of crisps. Both were dog friendly, and both had lovely staff and roaring fires. My family wanted to talk about Spencer – his art and wives. I managed that, and was also happy to talk over my route which had included a quick detour to see the house that Wind in the Willows author Kenneth Grahame lived in while writing the book. Behind is Winter Hill’s thick wood (and beyond that Quarry Wood), both very obviously the model for his book’s scary Wild Wood – home of Badger and those evil weasels who go on to take over Toad Hall. The house is now a prep school, Herries. Just being outside was incredibly reviving. When I got back into the warm I felt tired and content – happy to go along with my family’s suggestions. And the dog just lay down and slept. My plan this year is to keep a day a weekend as free as I can so that the micro-adventure habit can blossom. Perhaps what I like best about this plan is that anyone can come along, but it’s still fun if you’re the only one who wants to head outdoors. Walk route was in Country Walks near London by Christopher Somerville. I used the 1994 edition, but this links to a much newer version. Somerville is my favourite walk guide -his routes are great because you don’t have to have your nose in the book. It does help if you can bring an OS map too though. Do you ever find yourself thinking how to entertain young kids and teenagers at the same time? And what sort of things can you do with teens that parents might also enjoy? How about getting out into the woods with some marshmallows? Here’s how Nell, 14, and me (her mum) managed on a trip to Conkers in Derbyshire… There are more good ideas in Homemade Kids: how to raise children in a thrifty, creative and eco-friendly way author Nicola Baird. It’s so tempting to ignore the outside world. Children can be kept very occupied with screens, and love them. But if you want to let your kids have a taste of the great outdoors, but don’t know much about it yourself it can be daunting. That’s why places like the National Trust –with their rather cool list of 50 things you must do before you are 11 and three-quarters can be helpful. Back in dinosaur times my primary school had a nature table, but nowadays playing in the woods is occasionally part of the curriculum, see the forest schools. But if your home is in a town or city it gets tricky to give children these opportunities. There are parks, but no one is allowed to light fires or set up a tent in them, meaning children don’t really have a chance to do the things that they have always done. Sometimes we are a bit too safety aware. I grew up learning the Sooty song to “never, ever play with matches”. But when my eldest was 12 I realised she still couldn’t get a match alight. So we spent an afternoon striking matches (we used nine boxes) defying wind and weather. It was quite fun, and a useful skill was learnt. So how to take it one step further and build a fire, safely? A recent trip to Conkers with my younger daughter, Nell, who is 14, was a wonderful experience. 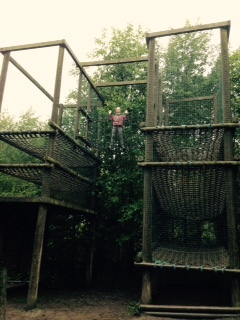 Conkers is an adventure hub at the centre of the newly planted National Forest in the Midlands. It’s about eight miles from Burton on Trent station – roughly midway between (and north a bit) of Birmingham and Leicester. 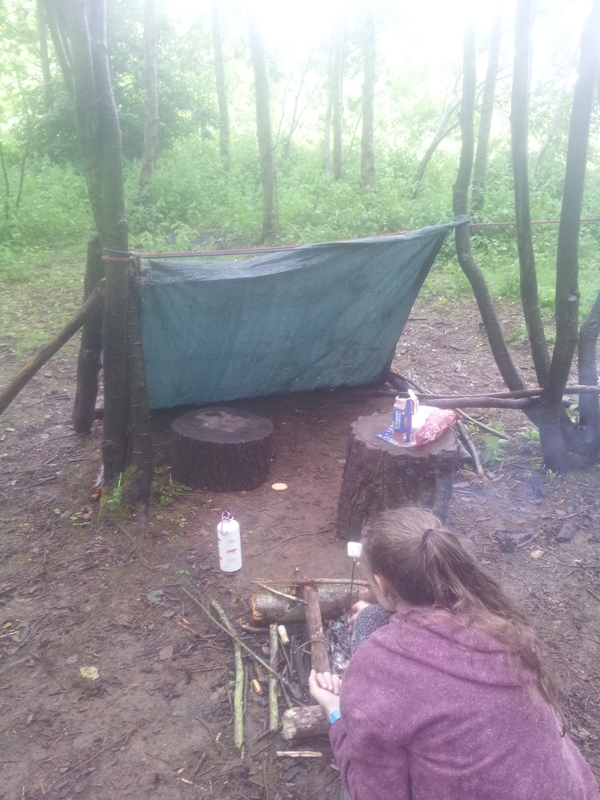 Despite uncharacteristic June rain falling all day Nell and I spent the whole day outside in the woods. 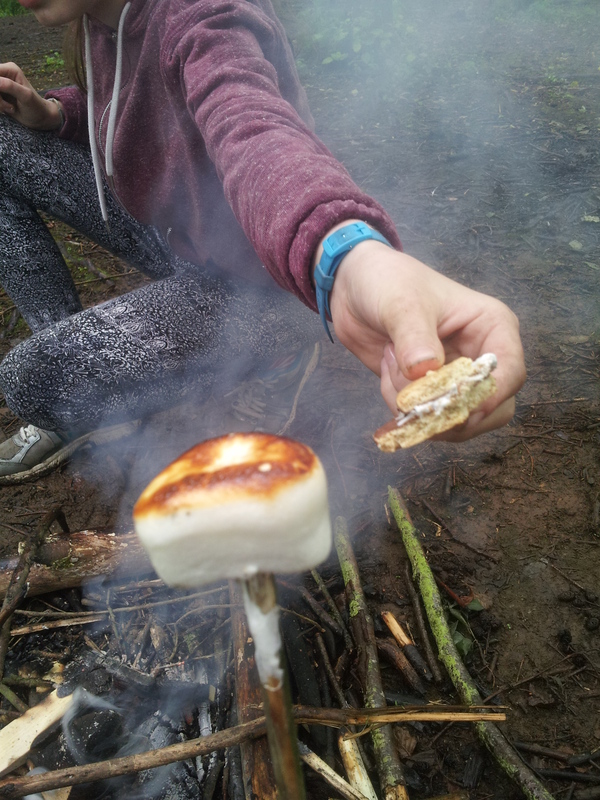 We learnt how to make our own shelter and light a fire and then toasted smores (marshmallows sandwiched by chocolate digestives) on our own fire. How happy we felt. Of course adventure supremo Bear Grylls knows this place – he was apparently at Conkers only a fortnight before us. 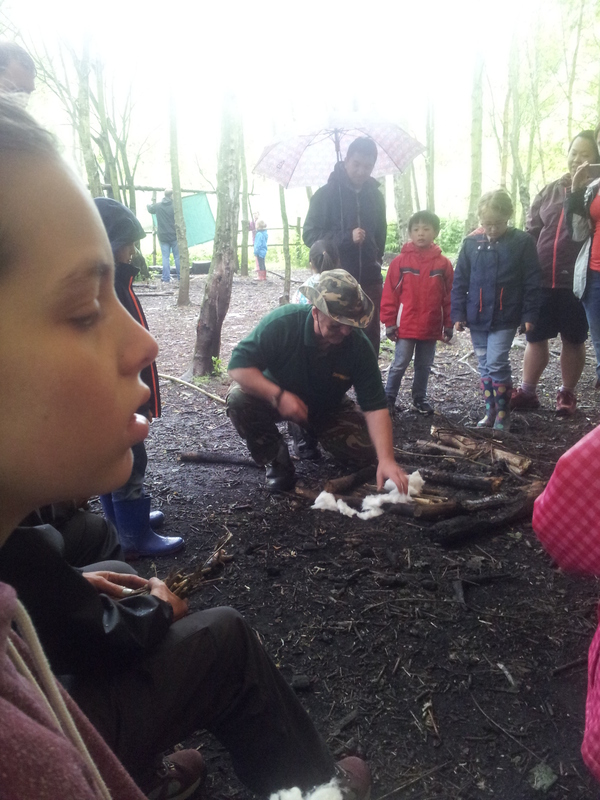 Conkers ranger John (in the hat) shows us how to use cotton wool to create a great fire. Nell looks a bit suspicious… but it all turns out OK.
First find a safe place to do this. If you are in your garden, don’t do it on bricks as they can explode. Maybe have a bucket of water ready to douse the flames. Clear a rectangle for your fire. You could remove a sod of earth and then replace it later on. Or you could put down 4 bigger logs to mark your fire area, then lay some thinner sticks along vertically to help air get under. Fluff up a large chunk of cotton wool so the air can get in and help the burning along. Get your flint and strike (available for less than a fiver on ebay – a generous party bag gift). Watch as the cotton wool blazes, then slowly make a triangle of sticks over the flame and see if they catch. Nell and I had to repeat this process twice – but it was raining. Bend your head down and blow to add a bit of oomph to your burning. Now slowly add more sticks. Bits of wood off-cuts (and pine branches lopped off your old xmas tree) will help your fire gain some heat. If this has worked then you are ready to cook marshmallows or make smores. Nell and I were at Conkers learning how to create a den and make our own fire with about eight other families – most with young children. The great thing about being outdoors is it is a huge leveller. Mums, Dads or whoever is the adult in charge can be safety monitors, but you can also send quite small kids off to look for sticks, help locate the perfect place to set up camp, find a stick suitable for toasting marshmallows on or just keep them occupied looking at the flames. 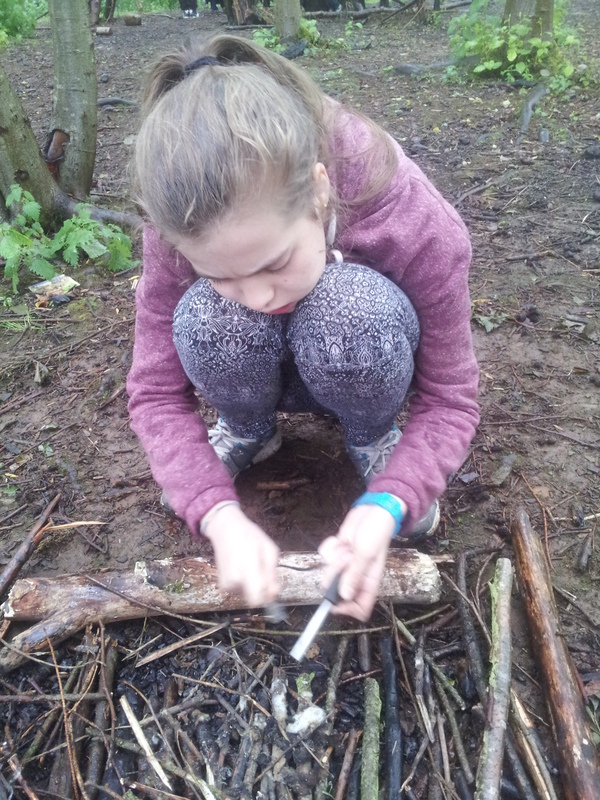 If you can find an activity centre that teaches a few survival skills then take your teen and go and learn (or even host a birthday party for them to share these skills). 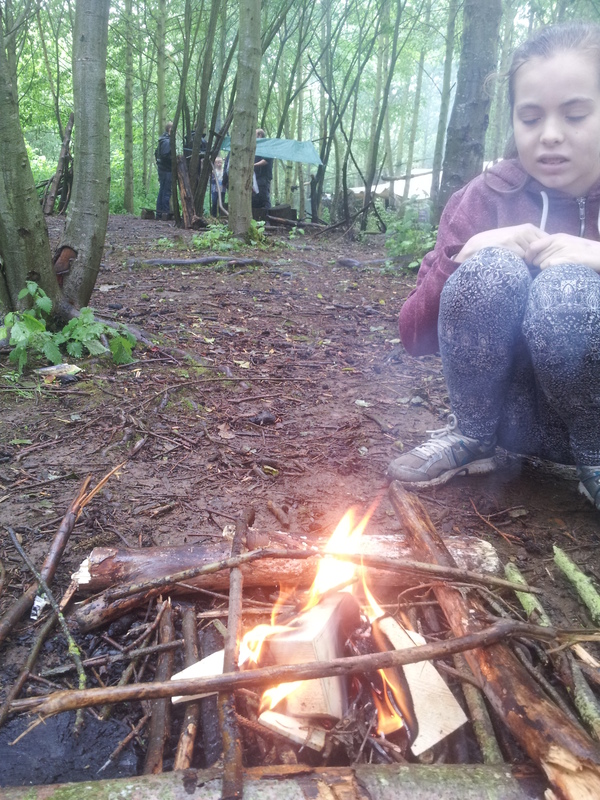 Despite being the oldest in our group, 14-year-old Nell really enjoyed making a camp and she thought toasting marshmallows was brilliant. While we were in the woods she hardly looked at her phone (although I was taking quite a few photos on mine). It felt like it was giving her a real break from the usual humdrum of eyes-on-instagram or playing Crossy Road. Instead she was getting her instant gratification from flames and food. Or squelch the marshmallow between your digestives, chocolate side inwards. Savour in front of the flames. Running around barefoot used to be a child’s birthright. Of course it’s all different now, but you can try a short barefoot walk in real safety at Conkers. Even when it is cold and wet if you take your shoes off and move, your feet are forced to do extra work, which stops them feeling too cold. 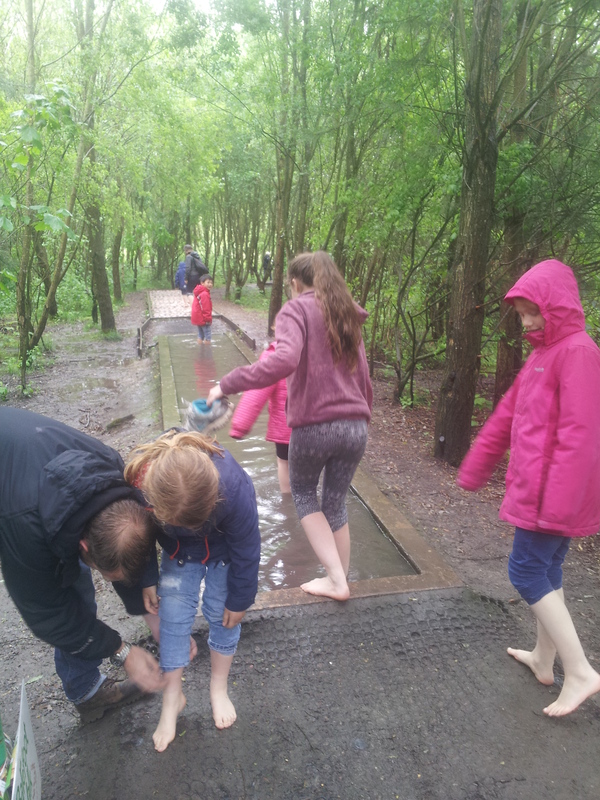 In fact by the end of the barefoot walk which took us through water, gravel-bottomed streams, slippy clay, coal paths and peat-silted streams your feet are tingling and warm. Conkers is where Rawdon Pit, in South Derbyshire, used to operate. It’s also not far from Moira where the owner of Rawdon Hall in the early 19th century tried to set up a spa with special calcified spring water in the hopes of rivalling Bath. In the end it was re-located to Ashby de la Zouch with limited success. But there’s a spa history to this spot so it’s a sweet way of re-connecting visitors with the local history. “We’ve made the barefoot challenge in three sections,” explained the friendly ranger, Tom. The first is through water and mud, like a spa experience – although he admitted it wasn’t perhaps quite as luxurious as the spas of today. The next is a nod to the kids who worked bare feet in the mines. Walking over coal is not comfortable, but to imagine walking over coal in the dark as a child, leading a horse helps make you realise how lucky you are. And the third section seemed to be more about mud and peat – so referencing ecology. But as I’m no fan of worms I tried not to think about this. In fact the peat and mud-bottomed streams were much the warmest to walk through. Your toes seem to develop extra-sensory perception. Lots of the smaller children were nervous about going into a water-filled ditch without shoes and socks. And of course they could have kept their socks on (though none did), or were reassured by holding a mum or dad’s hand. 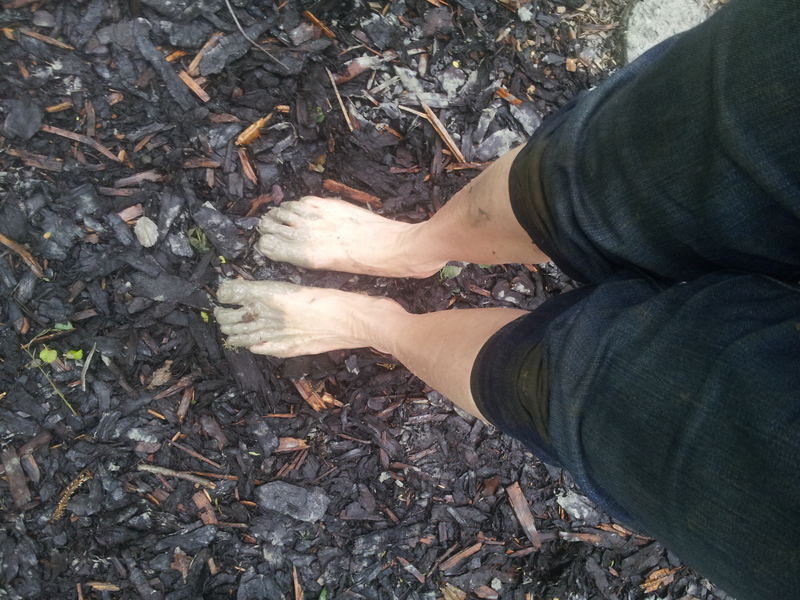 But Nell and I believed the ranger when he said this barefoot experience was like a spa, so we were instantly won over. Admittedly I hobbled around like someone with tender soles, but Nell found it fun and waltzed around. This is something teens and their friends would love to try – maybe you could set a mini version up in your garden with a bit of space, and imagination. The families with little kids have to keep a good watch on them at Conkers as there are lots of ponds – and lovely coots, geese and goslings too. Fortunately there are several places beyond the ponds which offer fun water-free challenges including a sensory walk, a labrynth (originally designed to help you meditate into the zone) and a maze. Or climb up high into the story-telling hut or the look out post to get new vantage points for a picnic. To make it as fun for bigger kids and teenagers there’s an assualt course which challenges the over 10s to think how to get over an assortment of 12+ tricky obstacles – the daunting looking sort I’m sure the army train over – that can be done as an individual challenge, as a race or team race. At first I couldn’t get up the rigging or over the 2 metre+ wooden sleeper barriers, but gradually I learnt to put my feet in the right place and drag my resisting body over the top. It was really good fun… and no surprise that when Nell and I got back late that evening to the Hilton Hotel, Leicester l where we’d been booked in by the PR who sponsored this tirp (because it’s on the M1 so easy for families with cars and taxis) I used the steam bath and had a swim to ease out the aches; fortunately it worked. Visiting indoor activities designed for kids is often so frenetic and noisy (and Conkers has this – with its Enchanted Forest Adventure) that it doesn’t always encourage fractious families to make repeat visits. But outside in the 120 acres the noise and friction disappears – it’s all bird song and laughter, once you’ve got the pesky fire lit. Nell and I had such a happy day, and learnt so much. If I lived anywhere between Leicester, Nottingham, Stoke-on-Trent and Birmingham I’d definitely buy an annual pass for £62.95 (for two adults and two children) and visit at least four times to enjoy the seasons as well as guided nature walks or spontaneous picnics. Under 3s are free, and 3-15 year olds cost about £7. It’s buggy and wheelchair friendly – and you can also use the mini train any amount of times to get between the waterside centre and the activity centre. Parking is free. In summer 2016 we plan to holiday in the Midlands and I’m definitely going back to Conkers to give my teenagers – and perhaps their friends – the chance to do the fire-making sessions, but also see if they want to try challenges like mountain biking along forest trails, kayaking or spend time on the high and low ropes adventure course due to open in July 2015. Ideally we’ll time it with the many tribute bands that play on summer weekends at the National Forest – think Abba, Elton John, ‘80s greats – and then maybe stay at the nearby eco-friendly hostel run by the YHA. See you there! Day tickets (for 2 adults and 2 children) cost £32.95. Standard adult is £9.75. Standard child (3-15) day ticket is £8.87. Under 3s are free. Conkers, Rawdon Road (B586), Moira, nr Ahsby-de-la-Zouch, Derbyshire, DE12 6GA. Nicola and Nell also stayed at the Hilton Leicester, close to Fosse Park which runs stay – play – explore deals. This 2015 offer costs £129 for 2 adults and 2 children to stay one night at the hotel (B&B) plus free entry to five different activities in Leicestershire including the National Space Centre in Leicester, Conkers, Stonehurst Family Farm, Twinlakes Family Theme Park and Twycross Zoo. 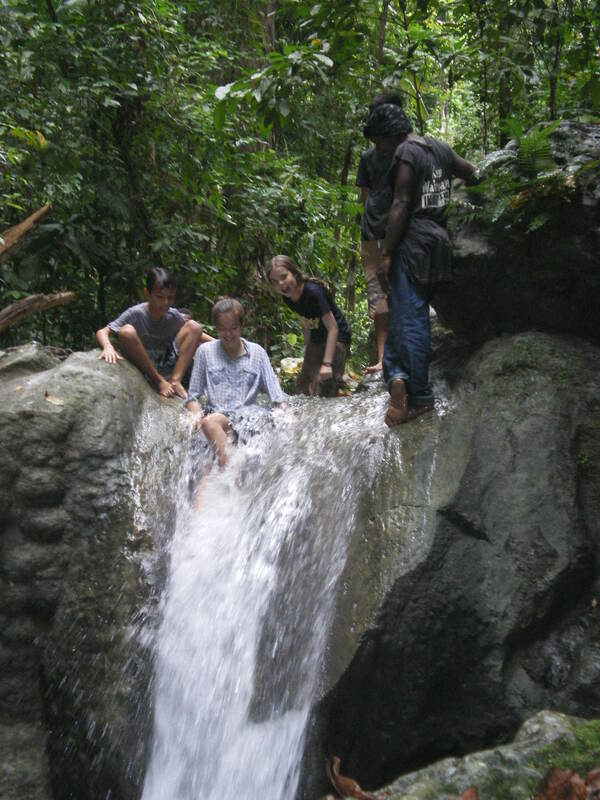 On top, behind and going over a waterfall. Parents either look away or check it’s safe before they jump. It’s a daft list – because anyone could live without needing to do any of these things. However if I was living in Brazil or Turkey now (despite the right political instincts) I do wonder if I’d be brave enough to be out on the street protesting? Worse I reckon I’d use my kids as an excuse, like this, “I can’t campaign for civil liberties… because I need to look after my family,” knowing it was a transparent lie. Parents are often frightened for their children – fortunately in the UK this is often for no good reason. But those parental fears mean that modern kids have a very short leash in case they are run over, abducted or mix with the wrong people. Teach the difference between no (it’s annoying but not life threatening if you don’t stop what you are doing) and STOP (must be obeyed – eg, by a road, if about to hit another child with a heavy object..) And an idea for mums and dads – get your mates together and do a First Aid course with a focus on babies. That way if your child chokes on a carrot you can sort it out. Challenge: Teach your child to swim – this may mean taking swimming lessons. At the very least teach water safety so they know not to run by pools & know that if they did fall in they should grab an object to help them float. They also need to know about staying away from ice. Challenge: Act out what might happen at home and then talk through solutions. Primary schools ought to have a be friendly (anti bullying policy) so ask the school office what they teach the children – you can then follow a similar approach. Challenge: Work out how self-sufficient she is (eg, with homey tasks – like dealing with laundry; locking up; making picnic lunch, flask of tea). This would be a lot more fun if I could just give her an animal to take 100 per cent care of for a while (go see War Horse the musical to see what I mean). Challenge: Let her do roughly what she wants to do but aim to answer questions, avoid making any conversation taboo, discuss news horror stories – people’s state of mind, how to avoid the situation, what would you do in that situation etc. Maybe offer books, share information etc. A really good website about drugs can be found at Frank. This post offers good reasons to enjoy the rain. For more info about my book Homemade Kids, with lots of ideas about thrifty, creative and eco-friendly ways to raise children click here or follow this blog. Singing in the rain room (an art installation where you get to control the flow). 1 It makes you sing. From Here comes the rain again to Singing in the Rain there are zillions of classics that make the best of the weather. 2 You miss the rain like an old friend. A friend born in India says his first memory is of the monsoon – how all the kids ran into the street and jumped around screaming with joy when the big rains came. 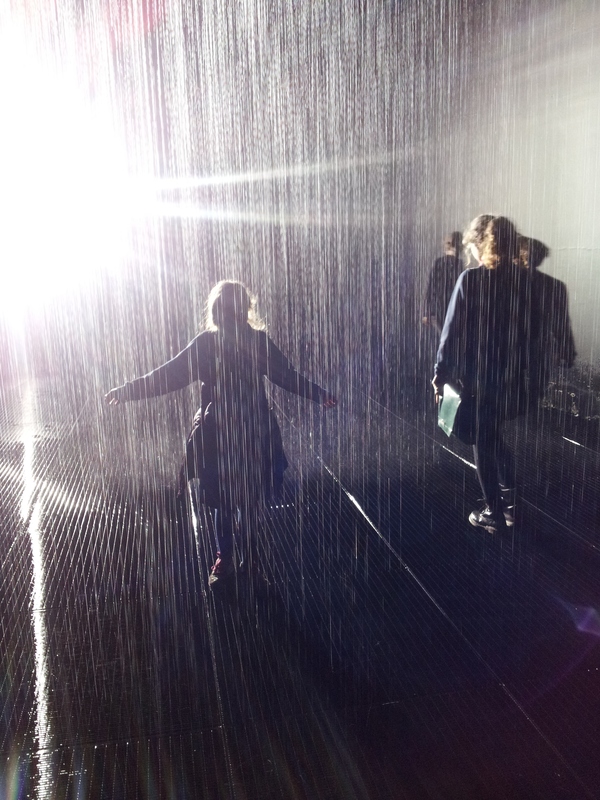 Nell, 11 and Lola, 14, agree – they were willing to queue for two hours at the Barbican to experience Random International’s rain room at the Barbican ( cost free, dates 4 Oct 2012 – 3 Mar 2013). Once in the downpour (like a giant shower except that you control the rain so wherever you walk you don’t get wet) it was amazing to see how everyone reacted with childlike excitement. They smiled, kissed, tried to do little gigs (and sometimes slipped over which made everyone else giggle). Lola whirled around – a dry whirling dervish. In contrast Nell ran trying to defy control and was rewarded by getting very wet. 3 Splashing in puddles is a favourite activity for little people. Let them do it, let them get wet and then change their clothes if you need to do so. Or just organise decent fitting waterproofs to start with. 5 It’s life affirming. Rain causes floods, it washes away. It drowns. But in the end it’s life affirming. After the flood there’s the rainbow… even on a saturated farm with 600ha of flooded potato crop. What’s wrong with being normal? Nell cleans up the pavement. This blog post is by Nicola Baird sharing ideas about thrifty, creative and eco-friendly ways to raise children. This post offers a few more pre-Christmas ideas. For more info about my book Homemade Kids, with lots of ideas about parenting, click here. Lola asked me today “What’s wrong with being normal?” Maybe she wants a DS or doesn’t want to pick up crackers from the street anymore (see nell in pic!). Lucky for me I’d just read a column by the Guardian’s Adityaa Chakrabortty (definitely becoming my favourite columnist) and not only had an answer but could pass his column to Lola, and discuss at the breakfast table. Here it is – how british workers are losing the power to think. I think Lola might reconsider the danger of normal after this onslaught. But in my defence breakfast was about 10.30am, not too early for Oscar Wilde even? And anyway we do plenty of normal at home too. Last moment tasks before Xmas completed with joy thanks to having children around who are big enough to find, stir and wash a wooden spoon. See pix above. Christmas pudding steamed and filled with shiny gold coins (soak £1s for 24 hours in coca cola). Oat balls refilled to soothe Nell’s eczema and winter dry skin. Giving the Bond Street shop window displays marks out of 10. They are amazing – but the one I decided to photograph was Luis Vuitton’s luggage shown off with the help of stuffed elephant (toys) balanced on seesaws. Plus we ran a serious taste test to help identify clementines from satsumas. Our team – Lola, 13, Netta, 9, and Nell,10 – reckoned that clementines have shinier, oranger skin and in December taste sweeter. Some more quick gift ideas here – truffle making and scented oranges. In case you’re not feeling positive. Admittedly there are certainly lots of reasons for that this year if you add in economic doom and gloom, so to avoid, take a look at this useful set of top tips about 30 things to stop doing to yourself (eg, worrying, fearing failure etc). Sent from my wise and wonderful friend in Solomon Islands, see here. Any ideas for keeping the spirits up? Hollywood? Bollywood? No!! this time it's all about Nolly and Ghallywood!! I believe that everyone knows Hollywood, and that a lot of people know of or about Bollywood (Indian movie Industry), but what about Nollywood and Ghallywood? In my blog it's all gonna be about the West African specifically Ghanaian and Nigerian movie industry. My Journalist self follows fabulous people into fabulous places.